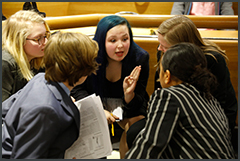 Maslon UPLIFT is a mock trial program serving 8th grade students who reflect the rich diversity of the Twin Cities. 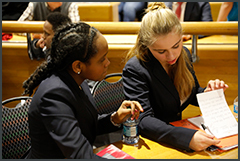 UPLIFT offers students engaging opportunities to learn from volunteer attorneys about the legal profession, criminal justice, and the court system. Participation in the program helps students build confidence, develop analytical and speaking skills, foster long term vision, and create a framework to pursue academic excellence in high school. The inaugural program launched as an after-school program at St. Louis Park Middle School during the 2017-2018 school year. St. Louis Park Middle School, with its strong commitment to racial equity and a diverse student body, was an ideal home for Maslon UPLIFT in its inaugural year. 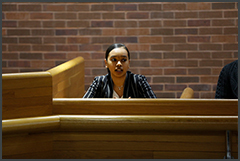 UPLIFT students had the opportunity to study the criminal justice system, from the investigation of crimes by police through possible sentencing by judges. They analyzed and dissected the components of a criminal trial, developing writing, reasoning, critical thinking, and analytical skills. On March 13, 2018, UPLIFT students presented criminal mock trials before actual Minnesota Judges in courtrooms at the University of Minnesota Law School. Read about the event. Selected images from the event are below. After a successful launch at St. Louis Park Middle School, the six-month program expanded to include Columbia Academy in Columbia Heights, Minnesota—and is currently underway at both schools for the 2018-2019 school year. Maslon UPLIFT is led by Catherine Ahlin-Halverson, a former partner who transitioned to the role of Public Interest Counsel in 2016 specifically to spearhead Maslon's mock trial program for local students and to serve as a mentor and leader across the firm’s pro bono efforts overall. With more than 60 years dedicated to strengthening both the legal profession and the community, Maslon is proud to stand behind the mission and values of the UPLIFT program. 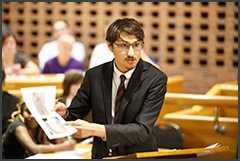 March 15, 2018—Minnesota Lawyer, "Bar Buzz: UPLIFTed middle schoolers in trial"
January 10, 2018—Minnesota Lawyer Features Maslon UPLIFT in an Article Titled, "Maslon mock trial program takes on education gap"
To learn more about volunteering or how to bring Maslon UPLIFT to your school or neighborhood, contact uplift@maslon.com.